The original Red Robin, the storied student hangout at the south end of Seattle’s University Bridge, is closing March 21, its historic building deemed too expensive to maintain. “We’ve decided not to renew our lease,” said Jessi Klein, general manager of the eatery known for its big burgers and beer. 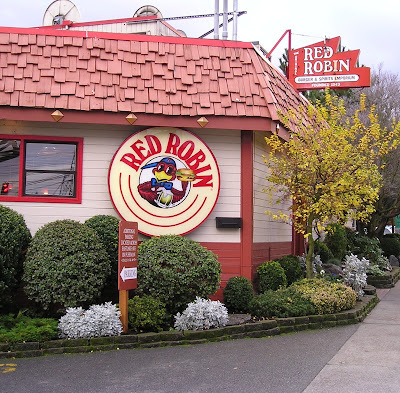 According to a company news release, the “decision was driven by the need for considerable investment to maintain the building and make the restaurant more efficient from an operations perspective.” As the restaurant to launch the brand more than 40 years ago, the first Red Robin location “has a rich history associated with it,” company president and Chief Operating Officer Eric Houseman said. In the wake of his splashy redo, business tripled, says Kingen. Red Robin eventually expanded to Northgate and elsewhere, and later franchised. “I basically created a grownup’s McDonald’s,” he says. In 1985 Kingen sold a majority of his ownership to a Japanese corporation for $6 million. “I told them, ‘give me a check for a whole lot of money and you can run it yourself!’ — and that’s what they did.” A year later, he reduced his interest in the company to 10 percent and soon after completely divested all company ownership. However, he held on to the Red Robin property until 2004, when it sold for $2.2 million dollars to Montlake Plaza LLC, according to county records. The 0.36-acre property on Fuhrman has been listed for sale for $2.5 million since last year and the listing indicated the site has the potential to be redeveloped into a mixed-use building with 29 residential units and 5,000 square feet of retail. space. According to the property’s owner, Anne Marie Kreidler, one of the names behind Montlake Plaza LLC and Zesto’s LLC Zesto’s (yes, that Zesto’s–the Ballard burger joint), she’s got plans for the original Red Robin. “The restaurant itself won’t be closed for very long,” she said Monday. “We are in the process of leasing it to another restaurant.” No names mentioned. Meanwhile, Red Robin is inviting those of you who have special memories of the original restaurant to share your story with the company (via e-mail at Universitymemories@redrobin.com). They’ll randomly select a winner a week for the next three weeks and award winners with a $100 Red Robin gift certificate good at any location nationwide. Me? I’m inviting you to share your memories right here on All You Can Eat. Your reward? My undying love and affection, as always.